Herbert James Forster was born at Bangalore, India in 1898 and attended George Watson’s College from 1907 – 1915. During his last two years at school, he was a member of the O.T.C. He became a dental student. Enlisting as a Private in the S.R. 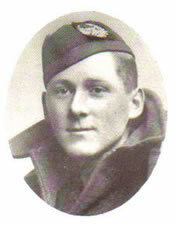 in 1917 he was transferred almost immediately to the 1st Royal Scots and served for two years in France. He was killed on 22nd November 1918 at Gauche Wood, Hendicourt near Gouzeaucourt. His name is on the WW1 memorial at St Michael’s Church.